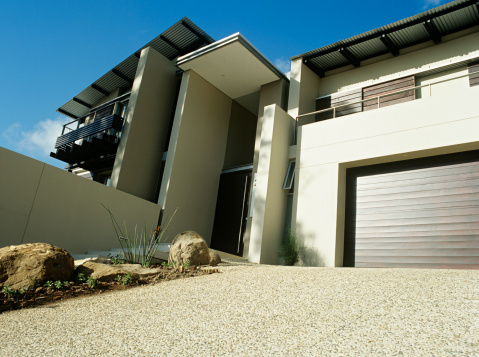 Wayne Dalton has been manufacturing residential garage doors and garage door openers for nearly 60 years. Wayne Dalton also offers electronic wireless keyless entry keypads that are compatible with many of their more recent garage door opener system models. When mounted just outside of your garage, a Wayne Dalton electronic keypad allows you to open or close the door by entering a user-selected, four-digit personal identification number. Programming a personal identification number for your Wayne Dalton keypad is so simple that it can be done in a snap. Press the "Program" button on the power head unit of the Wayne Dalton garage door opener; the LED indicator on the unit will illuminate. Push the "On/Off/Reset" button on the electronic keypad. The light on the keypad will illuminate to indicate that it is ready to accept new programming. Use the number buttons on the electronic keypad to enter a four-digit personal identification number of your choice. Press and hold the "0" button until the garage door moves, indicating that the keypad programming process is complete.